You’ve worked hard for your car, and it’s important to take care of it. Learning how to detail your vehicle isn’t something they teach you in drivers education, but knowing how to do so can save you a lot of money in the long run. Professionals only use microfiber cloths because they are amazing for washing and drying vehicles without causing any damage to the paint. If you choose to do the same, be sure to wash your microfiber cloths in a separate load. Washing them with your regular linens will eventually cause the microfiber to break down and lose its good qualities. When washing the outside of your car, use one bucket for soapy water and another for clean water. This way, you can clean your sponge and prevent transferring dirt from the surface of your car into the soapy water. If you want streak free glass, it will help to move the cloth in a variety of directions while drying. Also, always be sure to clean both sides of the glass for optimal visibility. Even if the inside of your window looks clean, it may be gathering small amounts of dust and grime. A lot of dirt can settle into your carpets, and if you want to get it all out, it’s a good idea to use a scrub brush to loosen everything up before vacuuming. Remove your floor mats and scrub all areas of your carpet, vacuum everything you can and repeat the process. By the second vacuum, you should get just about everything up. It’s easy to forget to clean your air ducts, but dust and dirt can easily settle there, causing musty smells and increasing your exposure to allergens. Using a portable air compressor is the easiest way to blow everything out. No detailing project would be complete without cleaning all the small nooks and crannies of your vehicle. For areas that aren’t easily reachable, use a Q-tip or small paintbrush. Your headliner should only be cleaned if there is a specific problem, such as a stain. Headliners are not built to withstand heavy scrubbing, and even a small amount of moisture can cause the glue that holds the headliner together to come undone. It’s a good idea to wax your car at least once a season. Many people forget this step, but waxing protects the surface of your paint and helps your car look nicer, so it’s important to take the time to get it done. Always use a non-acidic tire cleaner when scrubbing your tires. Acid-based cleaners can do a wonderful job, but because they can cause damage to alloy wheels, their use should be limited to professionals. Also avoid using any type of detergent on your tires. If it splashes onto the surface of your car, it could damage the paint. 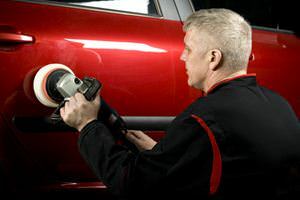 Detailing your car is a lot of work, and if you have the money, it would make sense to let the professionals help you. However, if you’re young and just starting out, detailing yourself could save you quite a lot of money, and you may even begin to find it enjoyable after a while.